Have you ever wanted to travel back in time, and get a glimpse of Wabanaki life on the coast of Maine thousands of years ago? The Abbe Museum Archaeological Field School gives you the opportunity to do just that. And there are still a few spots left for the 2014 program, so act now or miss out on a truly unique and inspiring experience. 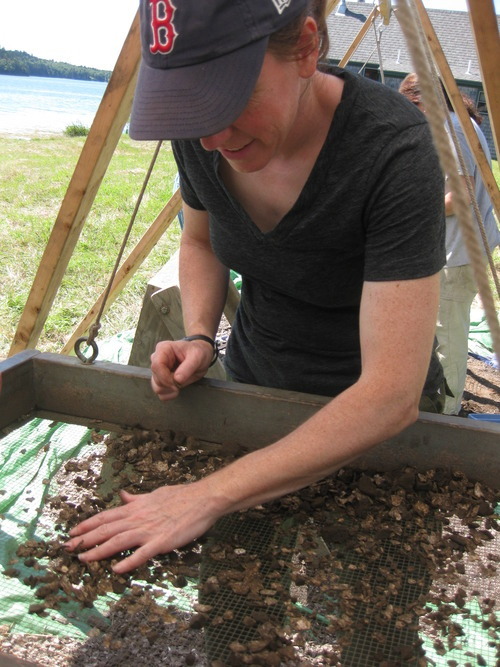 Click here for details about the 2014 Archaeological Field School and a link to the registration form. 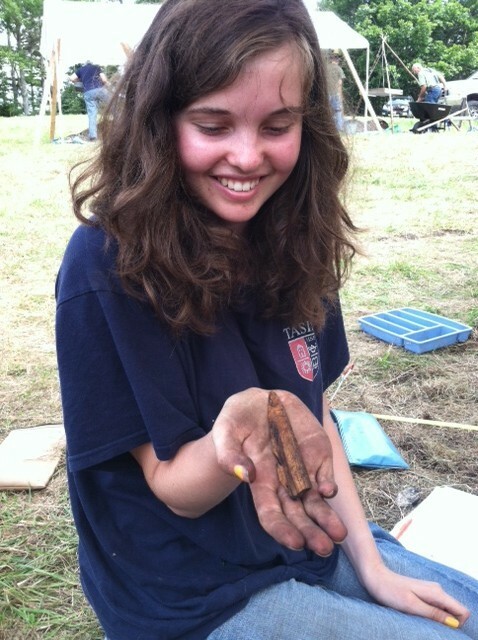 No matter your age or experience, the Field School offers the chance to get your hands dirty and uncover evidence of Wabanaki people living on Frenchman Bay over the past several thousand years. 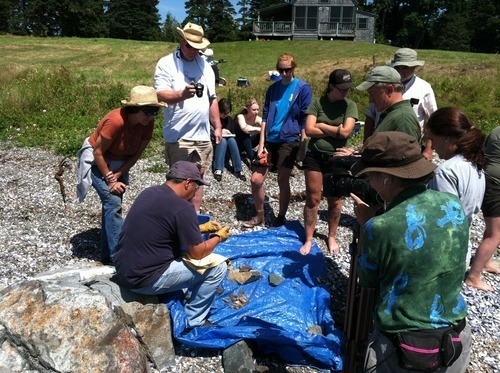 Participants learn how to carefully excavate a shell midden site, how to identify the types of artifacts that are uncovered, and how archaeologists analyze the results of excavation. But more than that, you will also spend time learning from Wabanaki scholars and cultural specialists about everything from how to make stone tools, to traditional music, and the importance of language preservation. The Abbe Museum also places a strong emphasis on bringing multiple ways of knowing to understanding Wabanaki history, with archaeology complimented by traditional knowledge, oral traditions, language, and the natural sciences. As a participant in the Field School, you will also contribute to the understanding of a type of archaeological site that is seriously threatened by climate change and rising sea levels. Coastal shell middens like the site excavated during the Field School, may be destroyed by a combination of sea level rise and increasingly powerful storms. Your work is part of an effort to salvage the information contained within these sites before they are gone. The 2014 Archaeological Field School returns to the Tranquility Farm Site in Gouldsboro, Maine. The site was first excavated by a crew from the Abbe Museum during the 1930s. While these early archaeologists collected lots and lots of cool artifacts, they were not using very advanced excavation techniques, and apparently keeping very few records. This means that the detailed information that could have been gained from a large area of the site was lost, but we do have an idea of what went on at Tranquility Farm based on the types of artifacts recovered. In the 1990s, the Abbe field school returned to Tranquility Farm, this time applying the great advances in archaeology made during the intervening decades. A small area of the site was carefully excavated. Evidence of wigwams on the site was uncovered, as distinct patterns in the color, texture and contents of the soil layers. Animal bones left over from food production and burned plant remains from fire hearths were used to begin to reconstruct the diet and subsistence activities of the occupants of the site. Radiocarbon dates on charcoal from fire hearths provided a date of approximately 1,200 years ago, and pottery decorations suggest that the site was used over a period of more than 1000 years. And a couple of small glass beads, which the Wabanaki would have acquired through trade with Europeans, tell us that Native people were living at Tranquility Farm when Europeans first arrived in the region. In 2010, the Field School again returned to Tranquility Farm, and we have been back every summer since, making gradual progress with one week of excavation each year. The current excavations are looking at an area adjacent to the 1990s excavations. Archaeologists have found in the last couple of decades that the area around the edges of many shell middens on the coast of Maine provide the most detailed insight into the lives of the Wabanaki occupants over the millennia. Relatively undisturbed by the destructive early 20th century digs, the perimeters show evidence of houses, fire pits, food storage pits, and other remnants of daily life. Uncovering and recording these complex features in the soil takes time and patience, but is very rewarding. Pottery fragments with decorations that suggest long-term use of the site. Stone tools made from both locally available stones and from material that would have been traded from as far away as Nova Scotia. Bone harpoon heads used to spear large fish, seals, or even small whales. Soil patterns including post holes indicating at least two different structures, and several fire hearths. Animal bones including bear, moose, deer, beaver, and a wide range of fish and birds, and lots and lots of clams. 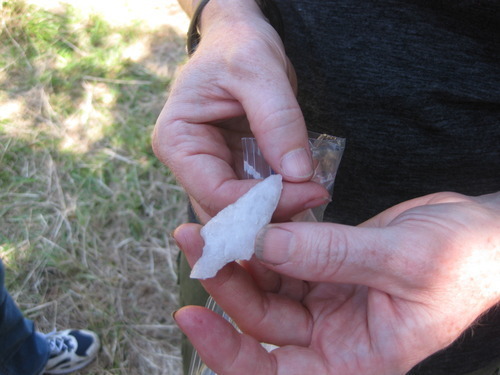 If you have a fascination with archaeology, and are inspired to learn more about Wabanaki history going back thousands of years, the Archaeological Field School is a terrific way to have a firsthand experience, while contributing to our knowledge. From the excitement of uncovering a stunning artifact, to the satisfaction that comes from oh-so-carefully uncovering the traces of a wigwam floor, to learning how to tell the bones of a fish, or a bird, or a bear, apart, and hearing the Passamaquoddy language and songs return to this place after several centuries of absence, the field school is a participatory learning experience you will not want to miss!